It has emerged that all 13 people killed in Sunday morning’s coach crash in northern Spain were young foreign women. 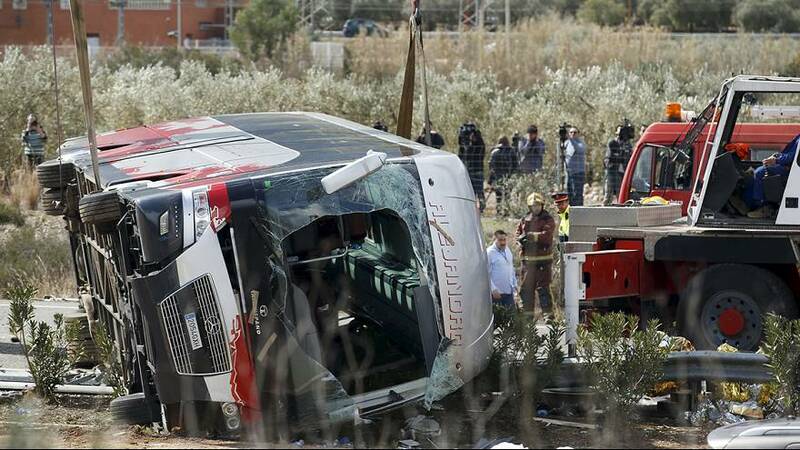 The bus was carrying Erasmus students from several countries home from the Fallas Festival in Valencia when it collided with a car on a motorway. All the others, more than 40, were taken to various hospitals. By mid-afternoon nearly 30 were still being treated, nine in a serious condition. The coach had travelled overnight, taking students back to Barcelona when it crashed near Tarragona in Catalonia at around six o’clock on Sunday morning. The number of dead was revised downwards from an earlier estimate of 14. The passengers came from well over a dozen countries all over the world. According to the Catalan government they came from Peru, Bulgaria, Poland, Ireland, the Palestinian territories, Japan, Ukraine, the Czech Republic, New Zealand, the United Kingdom, Italy, Hungary, Germany, Sweden, Norway and Switzerland. The Catalan government said the victims studied at various universities including the University of Barcelona and the Autonomous University of Barcelona. Reports say the bus driver lost control of the vehicle, causing it to cross the central barrier and collide with a car. Its occupants were apparently unhurt. The driver was interviewed by police. “It is important to mention that the coach driver tested negative for drugs and alcohol. The crash appeared to be due to human error,” said Spain’s acting Interior Minister, Jorge Fernández Díaz. Identifying the victims has proved difficult as many had no documents. By late afternoon post mortem operations had been carried out on nine of the 13 people who died. The crash is one of Spain’s most serious accidents for years. Catalonian President Carles Puigdemont said five minutes of silence would be held for the 13 victims on Monday at midday.